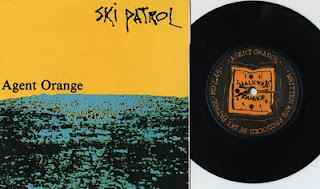 Ski Patrol After being ejected from punk group The Wall in 1979, singer Ian Lowery and guitarist Nick Clift (ex-Debutants) formed Ski Patrol, along with Pete Balmer (ex-Stranded, later to record with Fad Gadget) on bass and Bruce Archibald on drums. They released their first 7” Everything is Temporary / Silent Scream on their own Clever Metal label. Archibald was subsequently replaced by Alan Cole for the line –up which recorded the first of two singles for the Malicious Damage label: Agent Orange / Driving and Cut / Faith In Transition. Rumour has it that the anonymous synth player on Agent Orange is none other than Killing Joke’s Jaz Coleman.